The day starts simply for Sebastian and his best mate, Tolly. They are at an open day at uni, and while Seb should be deciding his career path, fate steps in. Well, actually, it is not fate, it’s Taylor Swift (aka Helena), the perfect girl. But then her boyfriend shows up and Seb’s perfect rom-com takes a dive – until he’s saved by Frida. Frida is sharp and funny, but she’s the wrong girl. Suddenly, the simple day becomes less simple but definitely more interesting as Tolly, Seb, Frida and, sometimes, Taylor Swift navigate the prospect of life after high school. Stories are told and retold, and as Seb finds himself becoming bewitched by Frida he is wary of her narrative – some things don’t add up. As we know from Michael Bauer’s Don’t Call Me Ishmael and the award-winning and haunting Running Man, Bauer can traverse the world of humour and heartbreak brilliantly. 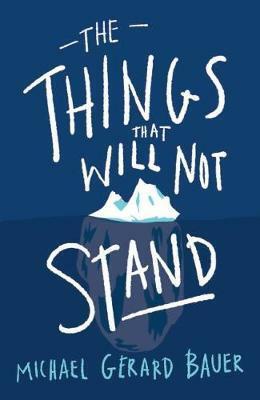 In The Things That Will Not Stand, one is juxtaposed against the other, and, while we laugh, just a few pages ahead the day darkens as the truth comes out about what Seb and Frida have both been concealing. Highly recommended for readers aged 12+.